Two members of the Buffalo State University Police force were honored by the SUNY Police Chiefs Association on November 19 in Albany. 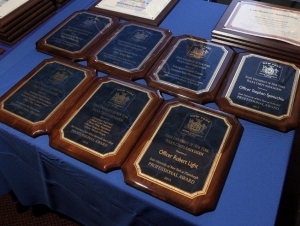 Lieutenant Michael Myers and Officer Richard Rogers each received the Professional Service Award, and were among 17 State University of New York police officers to be honored. Myers was nominated for the award for following a hit-and-run driver who struck a student at Grant and Letchworth streets, and for assisting the Buffalo police in arresting the driver. Rogers remained at the scene to provide medical assistance to the student. SUNY Chancellor Nancy Zimpher, University Police Commissioner Bruce McBride, and Chief Steven Dangler, chair of the SUNY Police Chiefs Awards Committee, presented the awards. 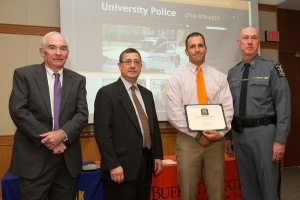 On October 28, the Buffalo State Buffalo State University Police Award Ceremony was held. Two officers—Investigator Thomas E. Einhiple and Officer Richard W. Rogers—received the Meritorious Police Service Award. Einhiple was recognized for his role in a credit card fraud investigation conducted in cooperation with the United States Secret Service, the Amherst Police Department, and the Erie County District Attorney’s Office. Rogers was recognized for his actions in the arrest of a wanted parolee and two other suspects who had an illegal weapon. Deputy Chief John A. Lombardo received the Excellent Police Service Award for his significant contribution to the Clery Act Annual Security Report. 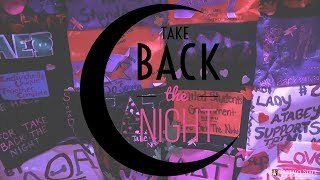 The Clery Act requires colleges and universities to disclose information about crime on and around their campuses. Lombardo also manages the campus alarm and access control systems. In addition, two university Police Officers received awards from the community. Officer Patricia Hayes received the 2013 Newman Award for her community policing efforts on behalf of the Newman Center at Buffalo State. Officer Edward A. Hellig received the 2013 Erie County STOP DWI Award for his significant contribution to traffic safety and DWI enforcement. Finally, University Police recognized Sarah M. Velez, interim director of student life, and Thomas D. Killian, director of networking and operational services. Each received the University Police Department Appreciation Award for their professional service and cooperation with University Police.